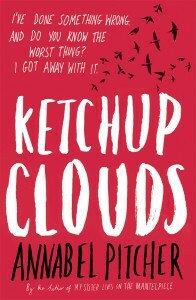 I was very excited to read Ketchup Clouds by Annabel Pitcher because I had read Pitcher’s previous book, My Sister Lives On The Mantelpiece which became one of my favourite books of the year with its humour, innocence and emotional depth. The blurb of Ketchup Clouds doesn’t give too much away, so I was totally surprised by it. In Ketchup Clouds, the main character who dubs herself 'Zoe' to keep her real identity secret writes a series of letters to a convict called Stuart Harris in America who is on Death Row. Zoe insists they have similarities between them. I was gripped by Zoe’s story and wanted to unravel the mystery behind Zoe’s guilt. Everyone makes mistakes, but not everyone owns up to them. Through the space of several months, Zoe slowly narrates to the reader how a series of events leads to a character’s death. I don’t want to give too much away in fear of spoiling it, but I can say I kept turning the pages to find out how it would all end. The characters were solid, real and complex. I felt for them. At times, I could tell Zoe was making a wrong decision and that nothing good would come of it, however, this didn’t deter me from reading. While I didn’t agree with the way she went about some things, she was human and relatable. Apart from the main storyline, I loved learning more about Zoe’s family and their troubles. There was a mystery here as well, relating to Zoe’s sister’s deafness. When the truth came to light, it was heartbreaking to read. Annabel Pitcher's writing made it very easy to read and relate to her characters. For example, prior to reading Ketchup Clouds, I thought I wouldn't enjoy this book as much as it was told through letters, but I was wrong. Annabel Pitcher is a remarkable writer. Her writing is extremely lyrical and vivid. I look forward to reading more from her. Excellent review, thank you Kulsuma! I need this book ASAP! Even though reading a book with a protagonist with the same name as me ;) It seems like a very poignant story. Great review! I can't wait to read more from Annabel Pitcher! :D Thanks for the comments.